To understand the link between blood pressure and dementia, SPRINT MIND investigators are continuing their research to answer the question: does intensely controlling blood pressure in patients with hypertension decrease dementia risk? 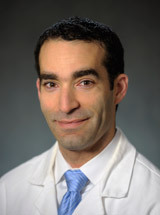 A study co-authored by Assistant Professor of Radiology and SPRINT MIND Investigator Ilya Nasrallah, MD examined the effects of intensive blood pressure control versus standard blood pressure control on dementia. Nasrallah works closely with Penn Memory Center clinicians and assists with reviewing patients. Hypertension, or high blood pressure, is a risk factor for many conditions, and the study of blood pressure is the main focus of the Systolic Blood Pressure Intervention Trial (SPRINT). SPRINT was designed to test the effect of more intensive blood pressure control on cardiovascular, renal, and cognitive outcomes in those without diabetes or preexisting stroke. The trial found that intensive treatment for patients with high blood pressure resulted in fewer heart attacks, strokes, and cardiac deaths. The results were so clear that it would have been unethical to continue research that would delay intensive treatment for the group receiving standard treatment. The trial ended early, and the results led to the American College of Cardiology and the American Heart Association changing their definition of what constitutes high blood pressure. However, the question of blood pressure’s impact on dementia risk remains, and is a question that the substudy of SPRINT, SPRINT MIND (Memory and Cognition IN Decreased Hypertension), aims to answer. In their recent study, SPRINT MIND Investigators analyzed 9361 adults with hypertension who were placed in one of two groups: intensive treatment or standardized treatment. Within these groups, probable dementia occured in some of the participants: 149 of those receiving intensive treatment and 176 of those receiving standardized treatment. With this, they found that slightly fewer people developed dementia while receiving intensive blood pressure control versus standard blood pressure control, however, the results were not significant due to the trial stopping early. While the findings suggest that there is a connection between intensive blood pressure treatment and reducing dementia risk, there were fewer cases of dementia than expected and those numbers affected the significance. Because of study’s findings, the Alzheimer’s Association announced that it will fund the SPRINT MIND study as SPRINT MIND 2.0 to explore these results further. SPRINT MIND 2.0 begins early this year.